As part of my rekindling with Tarot exercises, over the past few days I explored how to set up goals for this new year using the cards. As explored in my previous post, I decided to write this time about my exploration of Midheaven’s suggestion on combining astrology and tarot, and this approach which led to a number of options and areas to focus on throughout the year. I also drill down on what I consider to be my main objective for the year – linking with my spiritual community! Read on to find out. Why is that relationship spreads always veer to the romantic? I have talked to professional readers and they tell me that by far, romantic questions are the most common in the repertoire. When using Tarot as an instrument of reflection and self-discovery, however, relationships of any kind (not only romantic) may require clarification and support. In the past couple of months a couple of relationships (one professional and one in my family) have been strained, leaving me with lots of questions and wondering what can be done to heal and improve things. Unlike the case in romantic relationship, professional and family relationships are there to stay, so one must find a way to make them work. I set out to find a few spreads that could be used for this purpose and found some very interesting options, ranging from the simple (here) to the more complex (here). I finally settled for the 15-card double cross spread. I have seen it at work in the past and I really enjoyed the parallelisms across the two crosses. It seemed to me that unlike other relationship spreads, it could be easily applied to non-romantic relationships. So, thinking deeply about my co-worker, and how I feel about this relationship, here is what I found. I won’t bore you with the details but I’ll just draw a few highlights, perhaps you’d like to comment on what you see. Thanks for joining me today in my Tarot Initiation. What a better day to start this Tarot journey than World Tarot Day? 1. Me/Now – 10 of Wands. I am overwhelmed by other personal endeavours and this new project may add to my increasing list of activities and goals. I also feel that there is a lot of Tarot knowledge out there and this blog would help me organise and collate this knowledge. 2. Past/Resources – XV Death. I interpret this as that there isn’t much in my past that will help me in this journey, this is a clean slate and this “beginner’s mind” will be the greatest resource, a wide, empty receptacle of this newly found knowledge. 3. What I need – VI The lovers. This is the trickiest bit of this journey, being able to learn organically, hand in hand with my Tarot decks, books and Masters. Not making this an encyclopaedic, rational endeavour but a journey of the soul and heart. 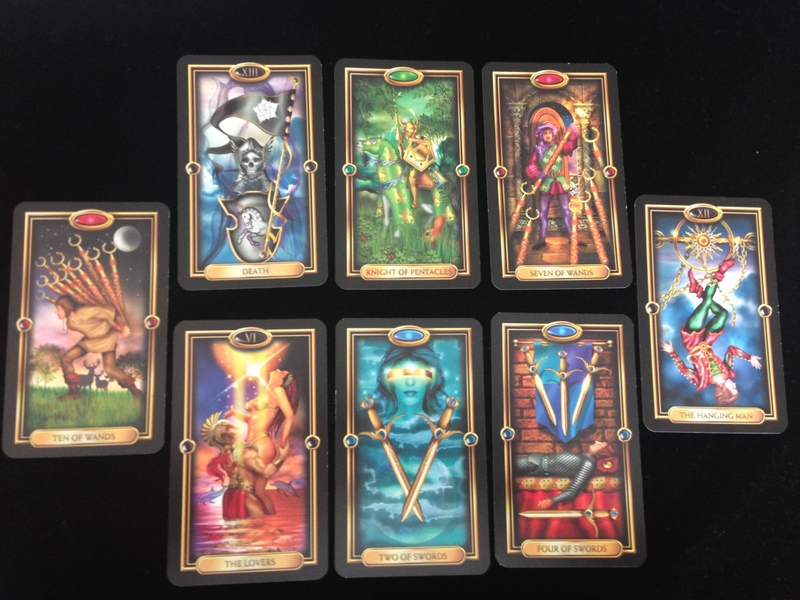 Tarot could become a reliable companion, if I give it the space it needs to grow. 5. What is hidden – Two of swords. By approaching my subconscious through Tarot, new hidden meanings to my live and path may appear. Eventually, a decision would need to be made in this regards. I hold the confidence in myself to stand for my beliefs and face the challenges presented by this journey. A calm courage is my best ally. This links nicely with card 1 – me/now. No progress can be made if I do not balance other aspects of my life and take proper rest of my Tarot practise. In a year’s time, if I follow the steps above, Tarot could help achieve a new perspective in life – a new view about Tarot and myself. What else could I ask? Happy World Tarot Day! What are your Tarot objectives for the year?